Centre for Excellence in Project Management (P) Ltd. having the brand name CEPM is India’s oldest and foremost Training and Consulting company that offers a wide range of project management related services. 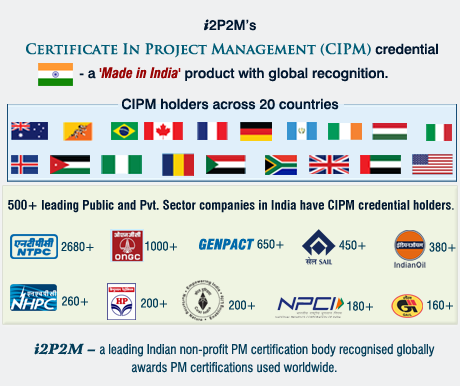 With 600+ clients CEPM has spearheaded the dissemination of project management across India with support from Government, industry, associations and leading professionals. CEPM is the first company in India to propagate the concepts of scientific project management. 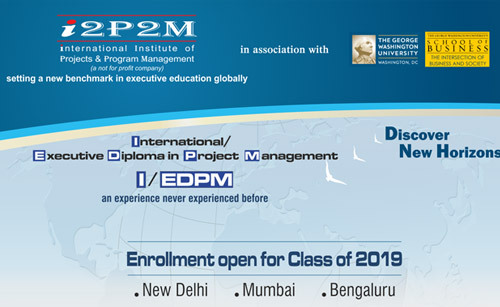 CEPM is the Accredited Training Organisation (ATO) of the International Institute of Projects and Program Management (i2P2M) and a foremost Global R.E.P. 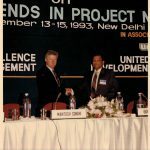 of the Project Management Institute since late1990s. 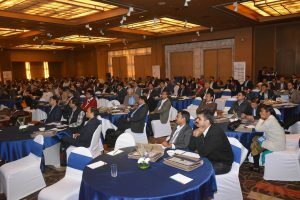 CEPM is the only company to have organised an annual Global Symposiums on Project Management every single year since last 25 years. First 3 years 1992-94 was held in association with United Nations Development Program (UNDP). We got support from Central and State Governments and various Associations and the participants were addressed by who’s who of India and global experts. We have exposed millions of persons on PM through electronic and print media, Lok Sabha & Rajya Sabha TV and ET Now and coverage across numerous print media. 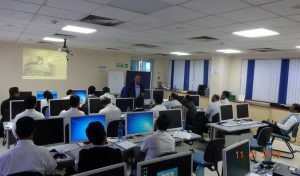 We provide par excellent classroom and web based PM training through its training site www.pmguruonline.com. We have trained 30,000+ persons thru classroom/e-learning mode. CEPM has conducted over 500 workshops / seminars covering CIPM preparation, IntroCIPM, Essentials of PM, Advanced PM, Agile PM, Critical Chain, MS Project, Risk Management, EVMS, PMP® etc. CEPM developed a world class 6 level Organisation Maturity Assessment Model to Assess Organisation’s Project Management Maturity (CEPM-OPMMA) in 1998-99 when doing a Consulting assignment for BHEL that has global inputs with Indian focus and is especially well suited for Indian CPSUs. CEPM has also developed two more world class models to Assess Organisation’s Human Capital Maturity (CEPM-OHCMMA) which has 11 key attributes across 6 levels and the Organisation Risk Management Maturity Assessment (ORMMA) Model. Consulting across many companies to coach and mentor employees,develop processes, improve performance. 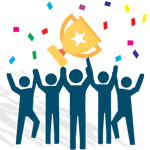 Successfully launched a National Project Management Team Excellence Award (PMTEA) in 2018. Cash Award and trophies sponsored by NTPC for Winning Team and IOC for the Runner-up team. CEPM gave the trophy and cash award for the Best Individual Performer. 75 participants in 17 Teams from 11 organisations participated. Computer based simulation programs with the leading Prendo Simulations of UK. CEPM was fortunate to have great encouragement from leading stalwarts of 1990s such as: Mantosh Sondhi, the legendary management guru and former Secretary to Government of India; Dr. DV Kapur, Founder Chairman of NTPC Ltd., Shri S Rajgopal, a well known Administrator and former Cabinet Secretary and Dr. Abid Hussain, Former Ambassador to United States. 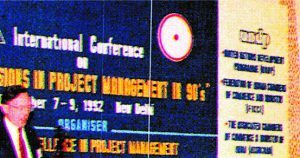 CEPM has been organising Global Symposiums on Project Management every year since 199 2. The first three years 1992-94 the conference was held in association with UNDP. 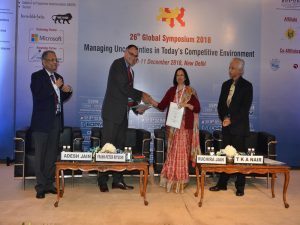 In 2017 we celebrated the 25th Global Symposium in New Delhi. 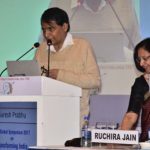 Suresh Prabhu, Hon’ble Union Minister of Commerce and Industry, Govt. of India, was the Chief Guest. He can be seen on left and below releasing the book “1992 – 2017 Building a Project Oriented Society” authored by Ms. Ruchira Jain, MD, CEPM. 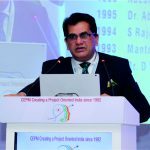 Amitabh Kant, CEO, NITI Aayog, (R) was the Hony. Chairman of the Symposium’s International Advisory Council. CEPM has trained 30,000+ persons on project management. We provide a large number of project management related training courses that are available as in-company / public workshops through traditional face-to-face training as well as online courses. CEPM is a partner of the non-profit International Institute of Projects and Program Management (i2P2M) for providing classroom training as well as online training through it’s training site www.pmguruonline.com. CEPM is also India’s first Global Registered Education Provider (R.E.P.) of the Project Management Institute. 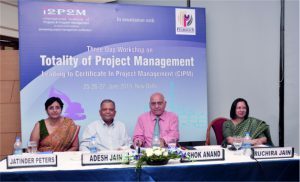 CEPM has developed the Totality of Project Management (TPM) body of knowledge which is broken into 8 project life cycle phases with cutting edge tools and techniques and soft skills which are also very important in managing projects. The PM credentials – Certificate of Project Management (CIPM), Introductory Certificate In Project Management (InroCIPM) and Project Management Essentials (crtPME) that are offered by i2P2M are aligned to the Totality of Project Management (TPM). Over 600 companies across 20 countries have opted for CIPM and we have provided the training via classroom / internet based online learning. We provide classroom training through In-company training as well as Public workshops and online training aligned to Totality of Project Management leading to the Certificate In Project Management (CIPM), the Introductory Certificate In Project Management (InroCIPM) and Project Management Essentials (crtPME), Earned Value Management (CrtEVM), Agile Project Management (CrtAgPM), Risk management, Advanced Project Management (CrtAPM), Critical Chain, MS Project, Primavera and PMP® preparation etc. The training ranges from 1 day to 5 days. We have conducted over 500 workshops / seminars in India and outside India. We have also provided training in association with leading companies / associations such as Microsoft, CBIP, SCOPE, IICA, PHD Chamber of Commerce etc as well as academic institutions such as IGNOU, IMT Ghaziabad, IMI, IIM Calcutta, University of Chicago center in Delhi etc. 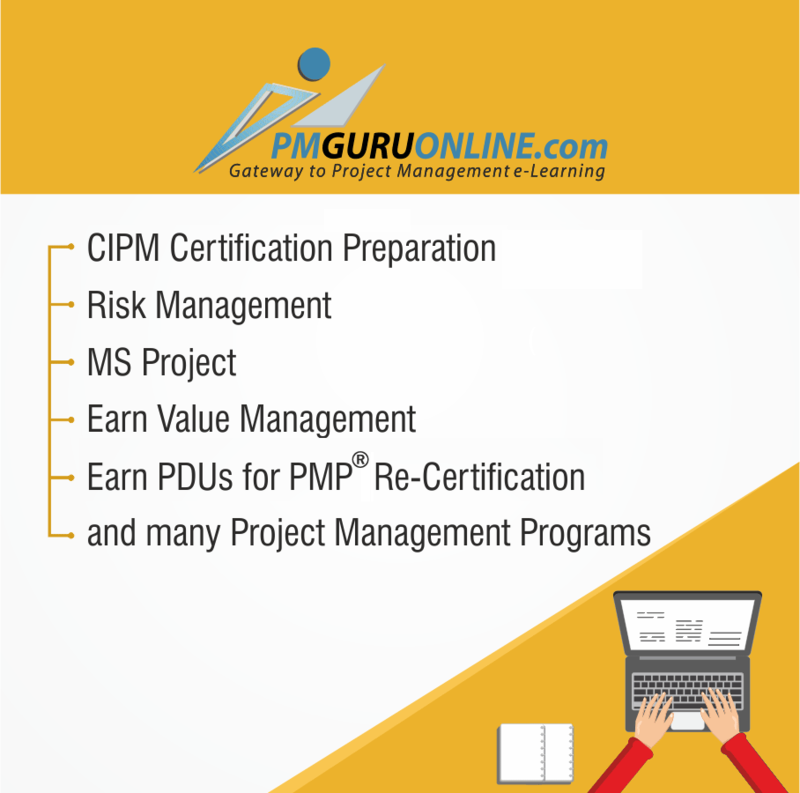 In 2003 CEPM pioneered online training and started our e-learning platform www.pmguruonline.com which is used worldwide by persons to prepare for different PM certifications and many other project management courses. In 1998-99, CEPM evolved a most unique and comprehensive maturity model to assess and measure the Organisation’s Project Management Maturity (CEPM-OPMMA) during the training programs it conducted for BHEL across it’s various divisions. This model to assess and measure the PM maturity of organisations was developed by the globally well known PM expert, Adesh Jain, who was then Director In-Charge of CEPM who had 30 years of industry experience having worked in North America and India. CEPM’s PM Maturity Model was developed keeping both global and Indian work scenario especially Indian CPSUs in focus. The model has 6 levels and checks 18 separate attributes to assess the maturity and was further developed over the years. The levels from lowest to highest are: ADHOC – RITUAL – COMPULSIVE – LEADERSHIP – VISIONARY – PASSION. CEPM’s PM maturity model CEPM-OPMMA is more comprehensive than ProMMM and most suitable for Indian companies especially Indian CPSE’s. CEPM was awarded assignment by three leading companies – IPRCL, NBCC and HSCC to assess their organisation’s PM Maturity. Human Capital Management Maturity Model (CEPM-OHCMMA) – this maturity model is a breakthrough model in addressing and measuring the maturity of human aspects in the organisation. It is applicable to industry in general and in specific to Indian CPSEs. CEPM’s OHCMMA model is an improved assessment model than P-CMM which is primarily meant for the software industry. CEPM was awarded the assignment by HSCC to assess their organisation’s Human Capital Management Maturity. The award based on 100% objective assessment was launched by CEPM in 2018 and was successfully held in July 2018 with 17 teams. It is the most objective way of judging the team’s skills in managing projects where they need to take hundreds of decisions and can see the cause and effect relationship of each decision. 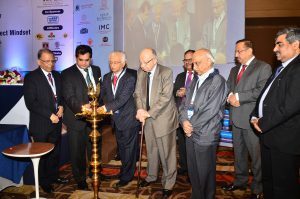 Companies such as Siemens, Tata Motors, NTPC, IOC, GAIL, HFCL, NBCC, IGL, BEML, DMICDC and BDL participated in this event. NTPC-Kudgi was the national Winning Team while GAIL was the national Runner-Up team. Mr. Santiram Mandal won the Best Individual Performer Award. A Cash Award of Rs. 1.5 lakhs + Trophy for the Winning Team is sponsored by NTPC; A Cash Award of Rs. 25,000/- + Trophy for the Runner-up Team is sponsored by IOCL; A special Cash Award of Rs. 25,000/- to the Best Individual Performer is given by CEPM. 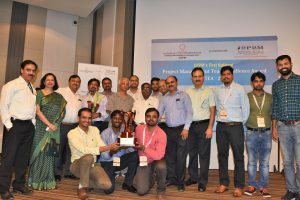 2018 PMTEA Winning Team from NTPC-Kudgi, sitting in front with the National Trophy along with some other participants and TKA Nair, Former Advisor to Prime Minister of India, SK Roy, Director (Projects), NTPC, Adesh Jain, Chairman i2P2M and the Award Director and Ms. Ruchira Jain, MD, CEPM who is on left. In 2016 we became the Indian partner of Prendo Simulations of UK which a world renowned leader in project simulation programs that provide excellent learning to participants where they have to make complex decisions in managing the projects. Same programs are used in top business schools for their Advanced Management courses like Wharton, INSEAD, Oxford, London Business School and MIT and in leading companies like Google, SAP, UNOPS, Total, Deloitte etc. CEPM coaches and mentors persons and guides companies to improve their processes and project management skills. CEPM has provided consultancy for leading companies like Indian Oil, ONGC and BHEL. C3 – CEPM developed the concept of C3 in its assignment with Indian Oil to reduce sulphur by addressing all three groups – Customer, Contractor and Consultant together for better synergy and effectiveness. This is a special assessment tool containing 48 questions that measures the current project management knowledge and strengths and weaknesses of users. On December 11th, 2018 during the 26th Global Symposium on Project Management in New Delhi, CEPM (India) signed a Memorandum of Understanding titled “Driving forward project management excellence for the EPC industry in India” with ProjectTeam® (Germany). The MoU was signed by Frank-Peter Ritsche of ProjectTeam and Ms. Ruchira Jain, MD, CEPM in the presence of Mr.TKA Nair, Advisor to former Prime Minister of India, and Member of the Board, JICA International, Japan and endorsed by Adesh Jain, Chairman of the International Institute of Projects and Program Management (i2P2M). ProjectTeam® is leading an industrial initiative, the innovation project “EPC 4.0” that was launched by leading consultancies and former executives in Germany in early 2018. Objective of this project is to develop practical guidelines for EPC companies as well as for investors, owners and operators of industrial plants how to approach innovative business models for industrial projects and plant operations and to describe concrete measures that have the potential to unleash the hidden potentials in our industry and to save up to 50% of CAPEX. 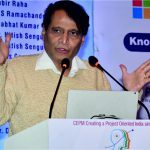 With this Memorandum CEPM and ProjectTeam® have established the framework to bring this initiative to India, to support the industry in India in their transformation process and to open up the access to the innovation leaders in this field within the Global Experts Network of ProjectTeam®. We provide full help in technology solutions and setting up of a PMO. We conduct workshops on MS Project and Primavera software as well as online training on the software. 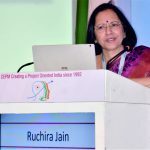 Ruchira Jain who has over 30 years of experience is MD of CEPM since 2013. She became India’s first Certified Senior Project Manager in 2007 and was the first Certified Project Management Associate of India in 2000. She is also a well known trainer and has personally trained over 10,000 persons. She has written two books. Her first book was released in 2013 by Dr. V. Moily, Hon’ble Union Minister of Petroleum, Government of India. 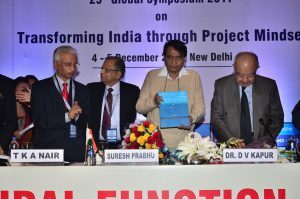 Her 2nd book “Building a Project Oriented Society was released on 4th Dec 2017 by Hon’ble Union Minister, Shri Suresh Prabhu. Since 2001 she has conducted a large number of very highly appreciated workshops and has trained about 10,000 professionals from companies like ABB, Adani, AAI, Afcons, Areva, BG India, Birla Management Centre, BPTP, CITEC, Churchill India, DRDO, EdCIL, Essar Oil, Fortis Healthcare, GAIL, HFCL, HPCL, Indian Ports Association, Idea Cellular, Indian Oil, IRCON, Infineon Singapore, Jindal Steel& Power, JCB, Jubilant, Johnson Controls, L&T Infotech, L&T Construction, Lanco, Min. of Statistics & Programme Implementation, Mahatma Gandhi State Institute of Public Administration, NHPC, Nuclear Power Ltd., NTPC, Nayara Energy, New Holland, ONGC, Oil India, Power Grid, Punj Llyod, SAIL, Siemens, Tata Projects, Tata Power, Tecnimont ICB, TCIL, Tehri Hydro, Thermax, RVNL, etc.etc. Mrs. Jain is one of the Subject Matter Experts of the globally used, top-rated Project Management e-learning site – www.pmGURUonline.com which was/is used by leading companies like Infosys, WIPRO, Genpact, Airport Authority of India, Headstrong, NTPC, BHEL, IREL, NTPC, Indian Oil., NHPC, Oil India etc. Mrs. Jain has been a speaker at various international and national project management conferences including the Global Symposiums on Project Management and was an Invited speaker at the PM World Congress in Panama, in Sept. 2015 and was also invited to be the Keynote speaker at the IEEE seminar held in New Delhi in March 2004 and again at the IEEE–Jamia Millia Islamia ENCOMIUM 2004 all India Meet in September 2004. She also holds the Certificate in Project Risk Management (CrtPRM), Certificate in Complex PM (CrtCPM), Certificate in Earned Value Management (CrtEVM) and the International Executive Diploma in Project Management (IEDPM). 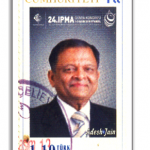 Adesh Jain initiated CEPM and led it as it’s Managing Director till 2012. Mr. Jain is a very renowned and well recognized global project management leader who is shaping the PM profession globally. He is currently the Chairman of the non-profit International Institute of Projects and Program Management (i2P2M) and the Hony. Advisor of CEPM. His dedication, commitment, passion and foresight is well appreciated nationally and globally. In November 2010 in recognition of his contribution, the Government of Turkey released his postal stamp. He is a former President of the Swiss registered International Project Management Association and till date is only non-European to have this honor. He was conferred IPMA Fellowship in 2006. He became Honorary Chairman of the China Construction Project Management Committee in 2006. In 2014 he was conferred the ‘Lifetime Achievement Award’ for his contribution in strengthening the PM movement in India. In 1999, he coined the word ‘Project Mindset’ while conducting a seminar in Stockholm. He worked in North America in Artificial Intelligence and supercomputing. On his return to India in 1973, he joined Bokaro Steel and was responsible to bring process control automation. In 1975 he joined Bharat Heavy Electricals Ltd. (BHEL) and in 1978, became the Head of one of the divisions of BHEL. 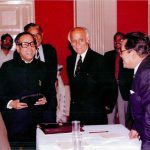 In BHEL he was the main architect of BHEL’s well known Integrated Project Management System (IPMS) which integrated technology with operations having multiple different SOPs. 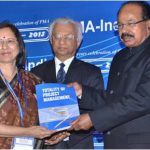 The former Petroleum Minister, Dr. M Veerappa Moily referred to him as the ‘Bhishma Pitamah’ of project management’ in December 2013. 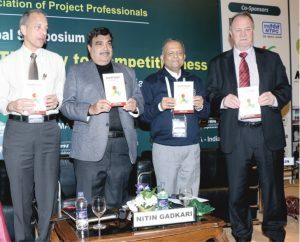 His book titled ‘Assorted Thoughts on Project Management’ was released by Hon’ble Shri Nitin Gadkari in December 2014. 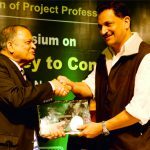 He was conferred the prestigious ‘Lifetime Achievement Award’ by Hon’ble Shri Rajiv Pratap Rudy, on December 8, 2014 for his far reaching 20+ years contribution in building a project oriented India. He was Independent Director of NTPC Ltd. from 2009 – 2012. Was member of the high powered task force set up by Government of India for fixing the targets for the major Central Public Sector Enterprises from 2006 to 2012. Is Honorary Chairman of the China Construction Project Management Committee (CPMC). He was President of the Swiss registered, non-profit International Project Management Association which has membership from 67 countries worldwide from 2005-2006 and then Chairman of it’s Council of Delegates from 2007-2008. Till date, he is the only non-European person to be elected as President of IPMA and Chairman, IPMA CoD since IPMA was formed in 1965. Was President of International Construction Project Management Association (ICPMA), Switzerland. Is a Member of the Advisory Board of the International Cost Engineering council (ICEC) which has members across 100 countries. Has published over 40 papers on varied aspects of portfolio, program and project management. He was invited twice by NASA in their PM Challenge in 2010 and 2012 and he spoke on ‘Breaking boundaries: the key to innovation‘ and ‘Awakening project consciousness through stakeholders alignment‘, respectively.